The recent late nights out spent partying and boozing will only leave my skin dehydrated and lacklustre. Welcoming 2011 with dull-looking complexion is definitely not my idea of starting a brand new year. However, thanks to Gleaming Skin, I can now repair & pre-tox my skin with an array of Korean beauty brands they carry. Presenting the Laneige Multiberry Yogurt Repair Pack & Peeling Gel. 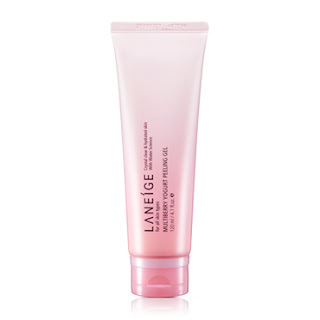 I've always been a fan of Laneige because of their quality, effective products and I especially love their essences. Having heard lots of raves about their yogurt repair pack and peeling gel, I was excited to finally get my hands on it. Sogurty™, a specialized fermented yogurt, promotes collagen synthesis, and enhances defense ability of skin from harmful external causes to leave skin healthier and firmer. Its anti-inflammatory effects also soothes skin from skin troubles. and strawberries) delivers abundant nutrition and antioxidants to eliminate harmful free radicals. Exfoliation for smoother skin texture. even denser and smoother skin texture. 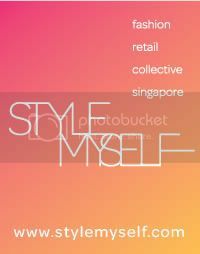 I saw this selling at Sephora Singapore for around S$45.00, you will enjoy great savings if you purchase from the Gleaming Skin shop instead. It's a whooping 20% off! 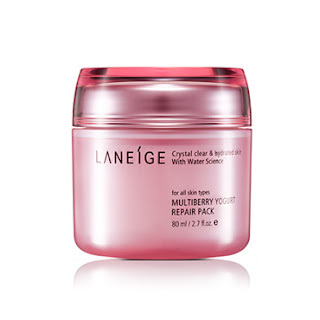 Just how often do Laneige counters or stores give such a huge discount off their products? I absolutely am in love with this product as it's rich, creamy texture feels luxurious on my skin. What a pampering treat I often love to indulge in! Not only that the yogurt repair pack looks and feels good, it also smells great! Spread this evenly across the face while avoiding the eyes and leave it on for approximately 5-10minutes. After that, rinse off with room temperature water and feel the difference. Skin appears QQ and feels moisturized and soft after rinsing. It is suggested that you use this after the peeling gel and also 1-2 times a week for best results. Hypo-allergenic peeling gel gently polishes skin for a smooth complexion with mannan and strengthen the skin barrier with the fermented yogurt. Natural Konjac (Mannan) beads gently exfoliate dead skin cells and impurities with short time of massage. water supply and sleek skin texture. Sogurty™, a specialized fermented yogurt, has anti-inflammatory effects to soothe skin from skin troubles. Gleaming Skin is selling this at 24% off the original price! Really a steal! This is another yummy smelling product which I adore. 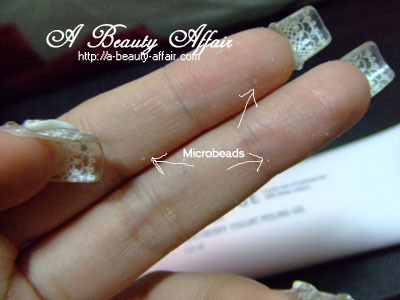 Some skincare products contain microbeads which are too big and end up kinda harsh on the skin. But not the Laneige Multiberry Yogurt Peeling Gel, its natural Konjac (Mannan) beads are so tiny that you can't really see but only feel it softly scrubbing against your skin. Really great exfoliator that is gentle on the skin, this is a staple for every bathroom! It helps ease out blackheads while removing dead skin so that your face appears brighter. If you want to, you can even use this on other parts of your body like the armpits or your neck. It is recommended to be used on wet skin, do avoid the eye area when applying. Use it 1-2 times a week for best results.